NEW NAME FOR ST IVES? 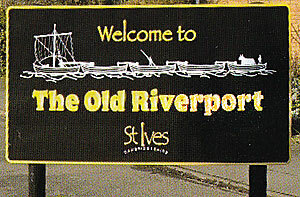 The St Ives Town Council is trying to promote St Ives as "The Old River Port" In an attempt to build up tourism - but the plan has had a mixed reception from residents. Wouldn't it have been clearer for visitors if the signs had read Welcome to St Ives (in large letters). followed by The Old River Port (in smaller letters)? 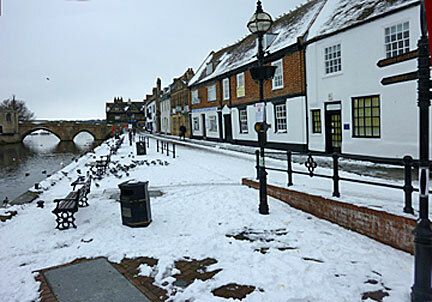 And, although St Ives certainly was an old river port, nothing of this now remains except the Quay! This is Westwood Road, St Ives, leading to the St Ivo School and the Leisure Centre. Despite years of objections by local residents, 30 new houses are to be built in the grounds of the St Ives Football Club, and the only access will be along this road. How can the road cope with this extra traffic? 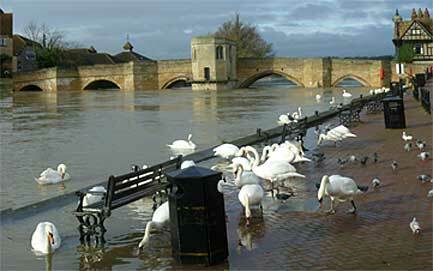 The end of The Quay may occasionally get slightly submerged - but the Flood Prevention Scheme has worked well - and the swans too are content enough. 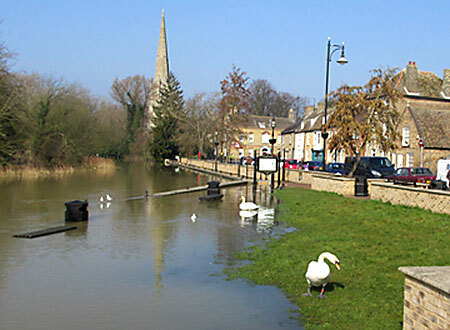 For more about the Flood Prevention Scheme, see Older News. In March 2016,this was the view from the bridge. The flood plains are serving their purpose. The Waits in March 2016. The lower area is flooded but the wall protects the road. Before the flood defences, the whole road used to get flooded. 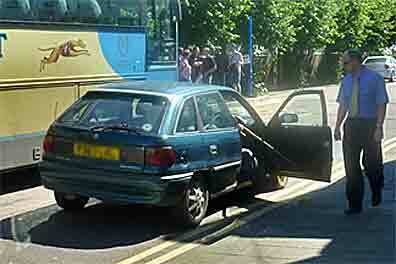 Following a road accident round the corner, it is no longer possible to drive through the Monday market. Only authorised vehicles (like this taxi) are allowed. Although it is not a popular move with some market traders and disabled drivers, it makes life much easier (and safer) for the ordinary pedestrian. The bus stop in Station Road is now used by all A and B guided buses going to Cambridge, instead of the nearby bus station that they just use for return journeys. 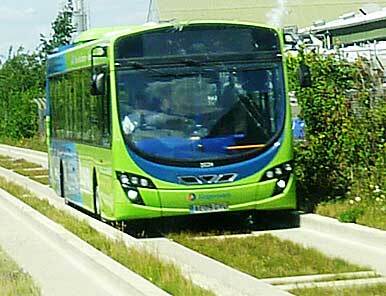 This relieves the pressure on the bus station and allows route A buses to come all the way into town instead of ending at the Park and Ride. 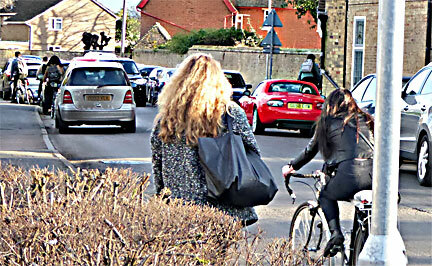 But, as locals sagely predicted, it can cause minor jams in Station Road, especially on market days. A bus driver points out to a driver that if he parks right there, it is quite impossible for the bus to turn into Station Road. 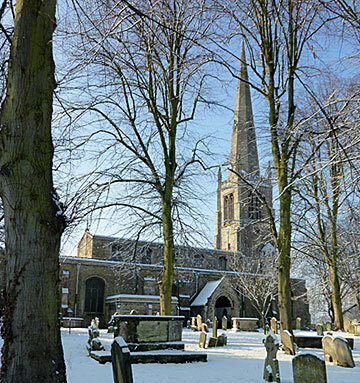 SNOW in February 2012, but it only lasted a day or two - and there has been hardly any since. 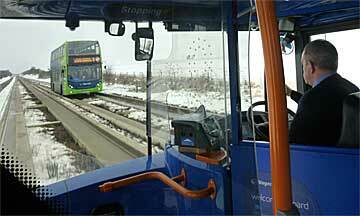 The new way-over-budget and much-delayed guided bus system between Huntingdon and Cambridge, via St Ives, opened on 7th August 2011. Cost disputes with the contractors were finally settled out of court in August 2013, leaving ratepayers with an overspend of £36 million. 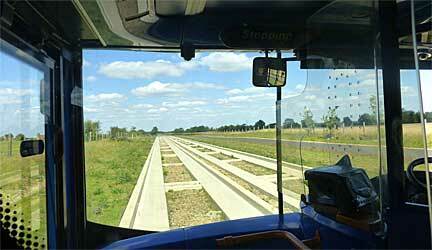 The busway is proving very popular, and was used by two and a half million passengers in its first year. It keeps going though ice and snow, as in January 2013. The journey from St Ives to Cambridge may take a few minutes more than it sometimes did on the A14, but it is much more reliable. 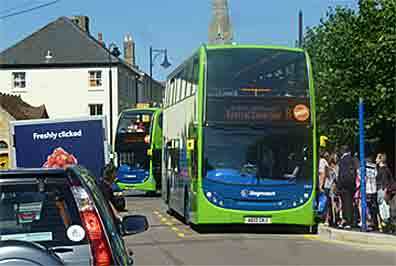 For the current timetable see http://thebusway.info. Passengers from Cambridge who want to get into the centre of St Ives should wait and dismount at the bus station, NOT at the previous Park & Ride stop which is misleadingly labelled St Ives. 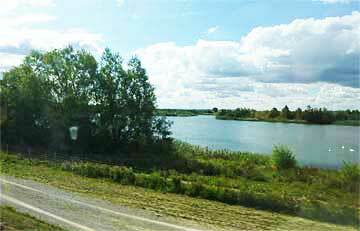 There's none of the excitement and drama of the A14, with bus drivers' occasional diversions into the countryside to avoid traffic jams. But you know you are very likely to arrive on time, and it makes a pleasant journey. 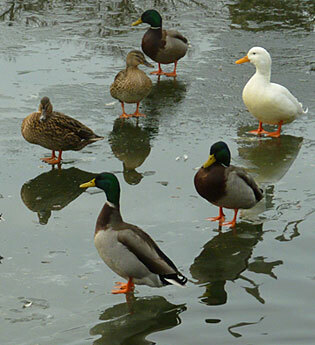 It has also attracted many more visitors to St Ives. 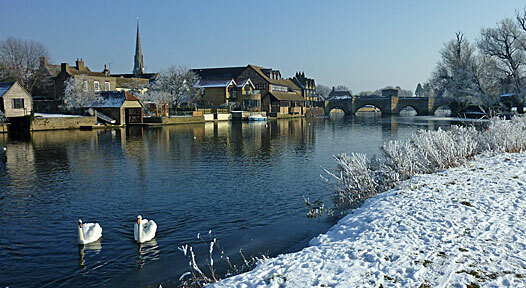 The most scenic parts are the lakes at Fen Drayton (above). Apart from these, you get a fleeting glimpse of a windmill and of Swavesey church. But there are always car traps (top right) to look out for. 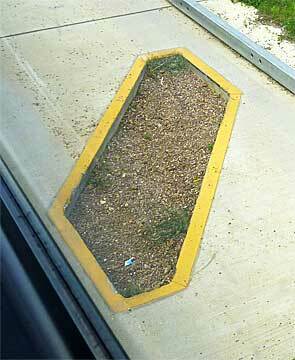 These are built into the start of the busway tracks to discourage cars - and were soon catching reckless drivers. Despite continuing maintenance and payment problems, it has proved a great success with passengers - especially the huge number with free passes! THE CORN EXCHANGE is another success story. 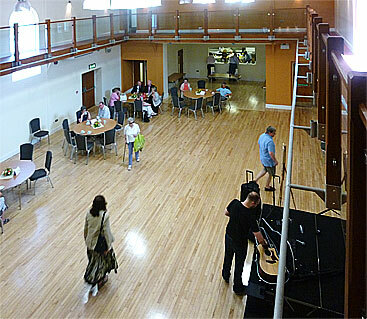 It re-opened in June 2010 and is now available for exhibitions, theatrical events and concerts, indoor markets, conferences and self-catering dinners and parties. Try visiting it on a Friday morning for the Women's Institute stalls and good cake and coffee! 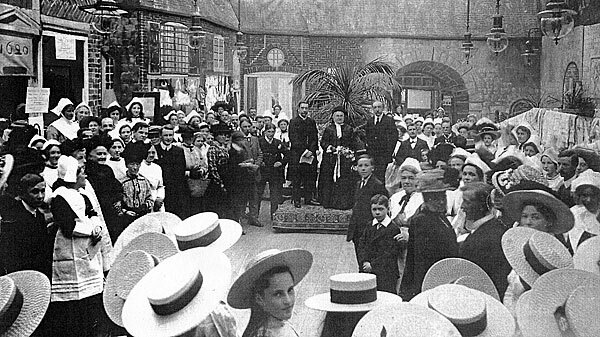 This was Mrs Bateman Brown (in centre of picture) opening a Free Church Sale of Work in the old Corn Exchange, presumably at the turn of the last century. 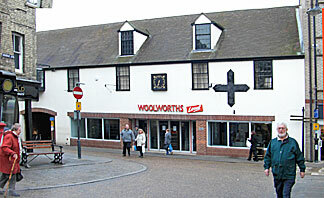 Woolworths closed in December 2008. 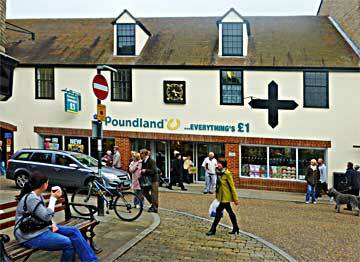 In October 2010 Poundland moved into the old Woolworth premises - and is now one of the busiest shops in the town. The black clock, presented to the town by the Civic Society, could always be relied on to show the wrong time. It has now been taken down. 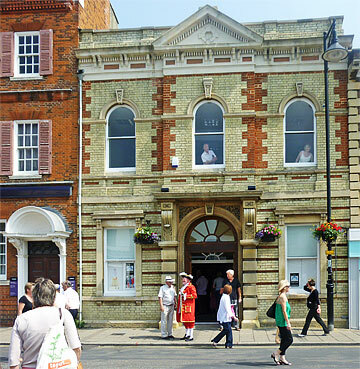 In June 2010 Grays long established butcher's shop in Crown Street was suddenly "closed until further notice". Days, another local butcher, took over - but it shut down hurriedly in September 2011 following a visit from the public health inspectors. 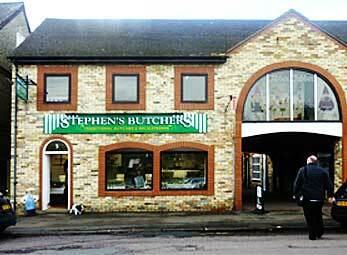 Now the good news: in October 2012, we were delighted to welcome Stephen's, a new butchers in Station Road. The large number of charity shops do good business - but are no substitute for "real" shops. 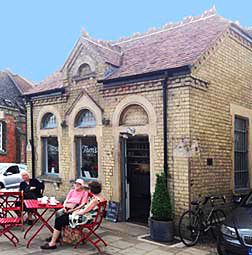 In 2014 Tom's Cakes opened in the old Hurdle House on Market Hill which used to be the office from which markets were run before they were rebuilt in 1886. It is thought to be where sheep hurdles were stored. 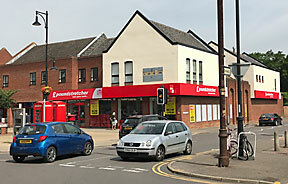 Budgens, the long established food store, closed in 2017 and was replaced by Poundstretcher. Them in 2018 the local branch of the Nat West bank also closed down. Market Day, July 2011: all eight cars are typically left parked on double yellow lines, but not all had disabled badges. The space outside the shop in the right background would make a useful dropping-off point if only cars were not left there. It is just as as bad today, when the lack of traffic wardens seems to leave drivers free to park anywhere, although the police have begun to ticket some cars, especially those that park on the roundabout. There is, in theory, now a 20 mph speed limit from the foot of Ramsey Road along The Waits, but the signs marking it are minimal, and it too is often ignored. 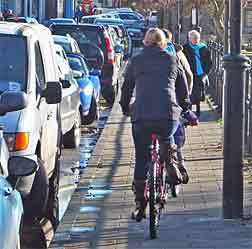 It is illegal for adults to ride on pavements, but with all those cars it is understandable. Also see the SHOPS page.